The Prosthetic rehabilitation of microstomia patients presents difficulties at all the stages. The difficulty starts with the preliminary impression making. This is due to the tongue rigidity and the decreased oral opening. A maximum oral opening which is smaller than the size of the tray can make prosthetic treatment challenging. 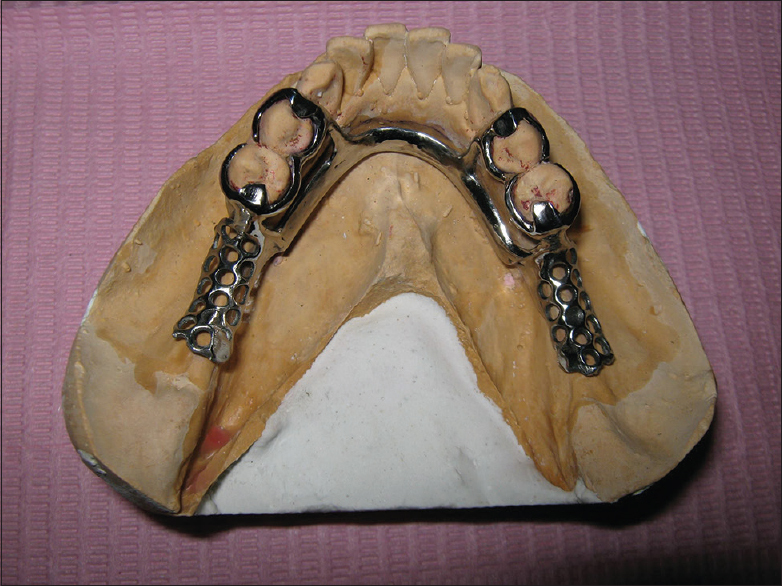 Due to the restricted mouth opening, insertion and removal of the impression trays is extremely cumbersome and various modifications of the trays have been used in the past. Among these are the flexible trays and the sectional trays used with different modes of reassembling the segments extra orally after the impression is made. This article reviews the literature published from 1971 to 2015 concerning preliminary impression techniques used in making impressions for patients with microstomia based on various tray designs. An electronic search was performed across three databases (PubMed, Science Direct and Google Scolar) for relevant citations. The keywords/combinations used for the search were microstomia, limited/constricted/restricted mouth opening/oral access, trismus, sectional trays, impressions and prosthetic/prosthodontic rehabilitation. The search was limited to papers written in English which resulted in a total of 45 related articles of which 17 articles were included for discussion of this review. Purpose: The purpose of this study is to evaluate the longevity of reduced disclusion time in treating and removing myofascial pain dysfunction symptoms following the T-Scan-based, immediate complete anterior guidance development (ICAGD) coronoplasty. This measured occlusal adjustment has been shown to reduce the muscle hyperactivity of myofascial pain. Methods: Myofascial pain symptomatic patients were recruited as per the diagnostic criteria for temporomandibular disorders (TMDs), including the clinical protocol and assessment instruments outlined by the international RDC/TMD consortium network (version: January 20, 2014) to assess the efficacy of reduced disclusion time in left and right lateral excursions to resolve the myofascial pain symptoms. 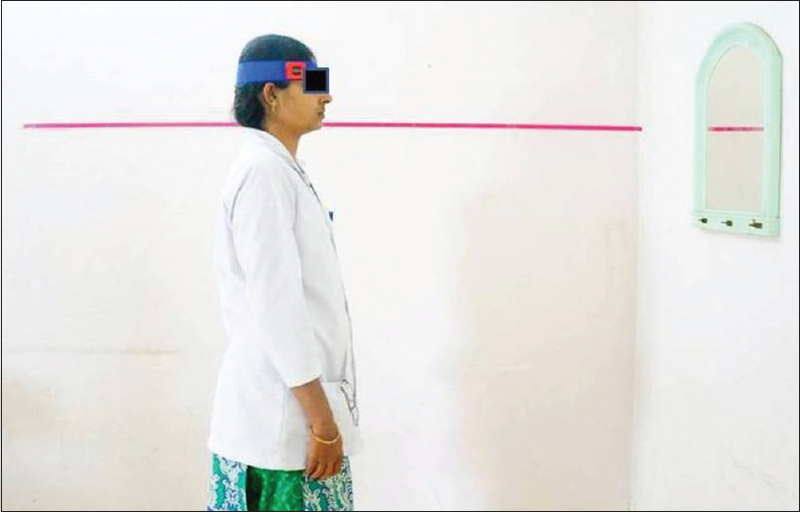 As per the inclusion and exclusion criteria, 100 cases were treated with ICAGD in three visits, each 1 week apart. Recall disclusion time measurements were recorded every 3 months over 3 years. The RDC/TMD questionnaire was used for symptom assessment at every recall visit. ICAGD brought pretreatment prolonged disclusion time down to <0.4 s, as quantified from T-Scan force and time data records, while the subjects were assessed for symptom relief. The Wilcoxon signed-rank test was used for statistical analysis (P < 0.05). Results: Changes in the intensity of many symptoms from reducing the disclusion time to <0.4 s were statistically significant from treatment day 1, and onward through the 3-year period of observation (P < 0.05). Conclusion: The results indicate that ICAGD reduces the musculoskeletal symptoms of myofascial pain, such that this methodology increases clinical therapeutic success. Statement of Problem: Many methods are reported in literature to determine freeway space (FWS), but they yield dissimilar measurements. Purpose: Recording FWS of patients during prosthetic rehabilitation is one of the important steps in dentistry. The purpose of this study is to evaluate the ability to predict FWS using lateral profile photographs (LPPs) in edentulous participants. Materials and Methods: Fifty-three participants in the age range of 20–27 years who met the inclusion criteria were recruited. LPP were taken for all participants using standard protocol and duplicate copy obtained; on which three soft tissue reference points, porion (Stp), gnathion (Stgn), and gonion (Stg) (Stg prenoted on the face) were marked and joined to form an angle Stp-Stg-Stgn. This angle was correlated with the mean FWS obtained using 3 methods, swallowing, phonetics, and no command. Simple linear regression model was used to develop a prediction formula for FWS using Stp-Stg-Stgn angle as the independent variable. Results: The angle Stp-Stg-Stgn had a significant negative correlation with FWS (r = −0.76, P< 0.001). Using simple linear regression analysis, the following formula was obtained: FWS (in millimeters) = 11.405 − 0.072 × (Stp-Stg-Stgn angle in degrees). Conclusion: Within the limitations of this study, considering the usage of LPP as a method to determine the FWS can be recommended. 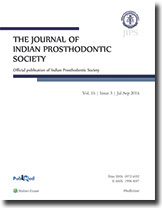 Aim: The aim of this study was to compare the accuracy of the angle made by Frankfort horizontal plane-occlusal plane on maxillary casts, mounted using the respective facebows on Artex Amann Girrbach and Hanau Wide-vue semi-adjustable articulators with cephalometrically derived Frankfort horizontal plane-occlusal plane angle as a control. Subjects and Methods: Maxillary casts of 30 subjects were mounted on Hanau Wide-vue and Artex Amann Girrbach semi-adjustable articulators following facebow transfer using respective facebows. The Frankfort horizontal plane-occlusal plane angles of these casts were measured using Wixey's digital angle gauge. They were also subjected to a lateral cephalogram, and the occlusal cant was measured using RadiAnt DICOM software. Statistical Analysis: Using Pearson correlation, the accuracy of the angle made by upper member of the articulator and occlusal plane of mounted maxillary casts in each of the articulator was compared to the Frankfort horizontal plane-occlusal plane angle in lateral cephalogram. Results: A mean difference of 1.9° was found between Hanau Wide-vue articulator and lateral cephalogram and a mean difference of 3.6° was found between Artex Amann Girrbach articulator and lateral cephalogram. Statistically, Pearson correlation value (r) obtained between Hanau Wide-vue and lateral cephalogram was 0.46 and between Artex Amann Girrbach and lateral cephalogram was 0.25. Conclusion: From the statistical value (r) derived, it can be inferred that the Frankfort horizontal plane-occlusal plane angle of the casts articulated on Hanau Wide-vue articulator was more accurate in comparison to that on Artex Amann Girrbach articulator. Statement of Problem: The osseointegration of dental implant is related to their composition and surface treatment. Titanium zirconium (TiZr) has been introduced as an alternative to the commercially pure titanium and its alloys as dental implant material, which is attributed to its superior mechanical and biological properties. Surface treatments of TiZr have been introduced to enhance their osseointegration ability; however, reliable, easy to use surface modification technique has not been established. Purpose: The purpose of this study was to evaluate and compare the effect of neodymium-doped yttrium aluminum garnet (Nd-YAG) laser surface treatment of TiZr implant alloy on their osteogenic potential. Materials and Methods: Twenty disc-shaped samples of 5 mm diameter and 2 mm height were milled from the TiZr alloy ingot. The polished discs were ultrasonically cleaned in distilled water. Ten samples each were randomly selected as Group A control samples and Group B consisted of Nd-YAG laser surface etched and conditioned test samples. These were evaluated for cellular response. Cellular adhesion and proliferation were quantified, and the results were statistically analyzed using nonparametric analysis. Cellular morphology was observed using electron and epiflurosence microscopy. Results: Nd-YAG laser surface modified and conditioned TiZr samples increased the osteogenic potential. Conclusion: Nd-YAG laser surface modification of TiZr, improves the cellular activity, surface roughness, and wettability, thereby increasing the osteogenic potential. Context and Aims: Long span is seen in many clinical situations; treatment planning options of these cases are difficult and may require: Fixed partial denture (FPD), removable partial denture, or implant supported prostheses. Each option has its own disadvantages: Mechanical, patient relief, and cost, respectively. This article will evaluate the stress distribution of another treatment option, which is adding a single supporting implant to the FPD using three-dimensional (3D) finite element analysis. Subjects and Methods: Three models, each consisting of 5 units, were created as following: (1) Tooth pontic pontic pontic tooth, (2) tooth pontic implant pontic tooth, (3) tooth pontic pontic implant tooth. An axial force was applied to the prostheses using 3D finite element method, and stress was evaluated. Results: Maximum stress was found in the prostheses in all models, highest stress values in all shared components of the models were close. Stress in implants was less in the second model than the third one. Conclusions: Adding a supporting implant in long span FPD has no advantages, whereas it has the disadvantages of complicating treatment and the complications that may occur to the implant and surrounding bone itself. Objectives: To investigate the effect of the addition of glass flakes on physical properties of conventional heat cure denture base resins and to compare it with a high impact strength denture base resin. Materials and Methods: Test specimens were divided into Group 1 - poly (methyl methacrylate) (PMMA) (Trevalon), Group 2 - Trevalon HI, Group 3 -5% glass flake +95% PMMA (Trevalon), Group 4 -10% glass flake +90% PMMA (Trevalon), and Group 5 -20% glass flake +80% PMMA (Trevalon). For glass flake modified groups, part of PMMA (powder) was substituted with the same weight of glass flake (GF003 m) as required, to bring it to 100% powder. Flexural strength was tested using three-point bending test and impact strength with Izod type impact tester. Results: Plain PMMA (Trevalon), showed the highest value of flexural strength followed by Trevalon HI. Trevalon HI (highly cross-linked PMMA) group showed the highest value of impact strength. Conclusion: Flexural strength of unmodified PMMA denture base resin decreases with increase in the concentration of glass flakes. Impact strength does not show any significant change at 5% concentration of glass flakes and impact strength significantly reduces with the addition of glass flakes in 10% and 20%. Background: Detachment of denture acrylic resin artificial teeth from denture base resin is one of the most common problems presented by denture wearers. Purpose: This study investigated the shear bond strength (SBS) and fracture type of bonding interface of two commercial acrylic teeth (Vipi Dent Plus e Biolux) to two denture base resins (Vipi Cril e Lucitone 550) after immersion in potentially chromogenic beverages (coffee, cola soft drink, and red wine) or control solution (distilled water). 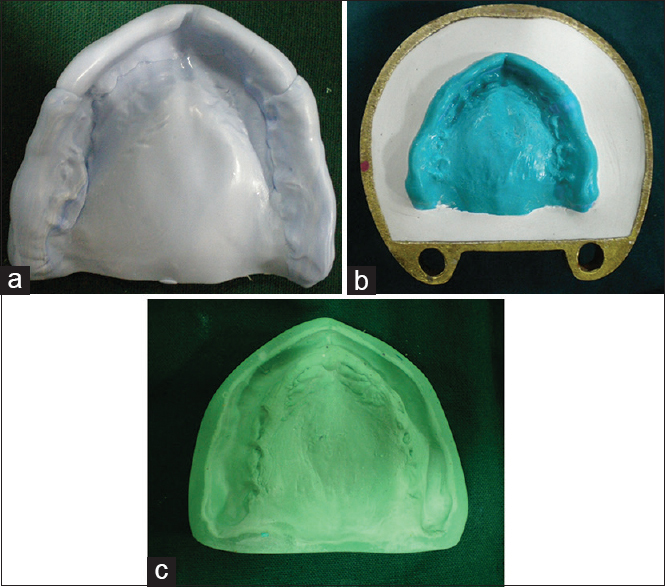 Materials and Methods: Maxillary central incisor acrylic teeth were placed at 45° to denture base resin and submitted to short polymerization cycle according to manufacturers. Specimens were divided according to the combination tooth/resin/solution (n = 8) and submitted to bond strength tests in a universal testing machine MTS-810 (0.5 mm/min). Subsequently, fracture area was analyzed by stereomicroscope at a magnification of ×10 and categorized into adhesive, cohesive, or mixed failure. Results: The bond strength of teeth/denture base resins interface was not significantly affected by tested solutions (P > 0.087), except for Biolux teeth immersed in coffee (P < 0.01). In all conditions, the Vipi Dent Plus teeth showed higher bond strength to Lucitone and Vipi Cril resins when compared to Biolux teeth (P < 0.003). All specimens' failure modes were cohesive. Conclusions: The SBS of acrylic teeth to denture base resins was not generally influenced by immersion in the tested staining beverages. Aim and Objective: To compare and evaluate the effect of ultraviolet (UV) stabilizers (Chimassorb 81 and Uvinul 5050) on the color change of pigmented elastomer. 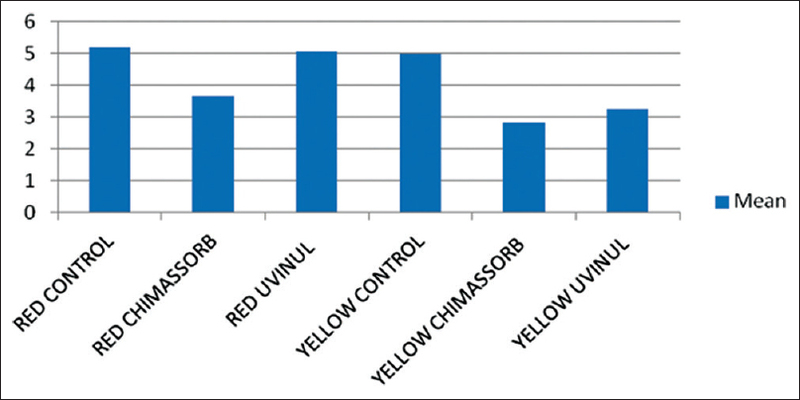 Materials and Methods: Two pigments - Red (P112 Brilliant Red) and Yellow (P106 Yellow) and two UV stabilizers Chimassorb 81 and Uvinul 5050 were studied. A total of six groups of 10 samples each were fabricated using a combination of the above colors and stabilizers: Group A1 - Red control, Group A2 - Red + Chimassorb 81, Group A3 - Red + Uvinul 5050. Group B1 - Yellow control, Group B2 - Yellow + Chimassorb 81, Group B3 - Yellow + Uvinul 5050. All samples were subjected to ageing in an accelerated weathering chamber (Weather-Ometer). Color values L, a, and b were measured at 500 and 1000 h for all samples before and after weathering and change in color (Delta E) was calculated. Results: All groups showed a significant color change. At 500 h, Chimassorb 81 showed a statistically significant lesser change in both colors (red - 3.66 and yellow - 2.8) compared to their control groups (red - 5.19 and yellow - 4.9). At 1000 h, both UV stabilizers showed lesser color change (A2 - 5.49, B2 - 4.28, A3 - 7.47 and B3 - 4.09) as compared to their respective control groups (A1 - 9.57 and B1 - 5.91). Overall, the change in the color with Group A was more than Group B. Conclusion: Addition of UV stabilizers helped the reduction of color change. Chimassorb 81 showed a greater reduction in color change in both colors consistently at 500 and 1000 h.
Purpose: The objective of this study was radiographic assessment of the premolar teeth abutments alveolar bone resorption in mandibular Kennedy Class I removable partial denture (RPD) utilizing the broad stress distribution philosophy, either designed with multiple circlet clasp or compound Aker clasp. Materials and Methods: Twelve patients were enrolled for this study with upper completely edentulous arch against mandibular Kennedy Class I ridges posterior to the second premolar. The patients were divided into two groups according to the type of the clasp assembly design used, where the mandibular Kennedy Class I RPD was designed with multiple circlet clasp and compound Aker clasp assemblies for Groups I and II, respectively. The abutment alveolar bone resorption was evaluated radiographically after 1st 6, 2nd 6, and 12 months of mandibular Kennedy Class I RPD insertion. Results: Second premolar abutment interdental alveolar bone resorption was significantly increased as compared to first premolar abutment along the interval periods of the study for Group I. The reverse was observed for Group II. Along the interval periods of the study, the alveolar bone resorption at the first premolar abutment of Group II was significantly increased compared to that of Group I while the reverse was observed when comparing the second premolar of Group I with that of Group II. Conclusion: Compound Aker clasp is better than the multiple circlet clasp assembly as it reduces abutment alveolar bone resorption regards broad stress distribution philosophy is considered for distal extension cases. Objective: The objective of this study is to identify the influence of early clinical exposure for undergraduate students on self-perception of different aspects of geriatric dental care. Materials and Methods: We have selected two different colleges from Japan and India, namely, Tokyo Dental College (TDC), Tokyo, and Government Dental College (GDC), Nagpur, respectively. The GDC students exposed to patients in a 3rd year and TDC in the 5th year of course. Survey of 74 undergraduate students GDC and 95 of TDC was conducted. The questionnaire was developed based on to the 50 points undergraduate curriculum by European College of Gerodontology. The questionnaire categorized into four parts; Part I (15 questions) on aging and medicine, Part II (15 questions) on communication skills, Part III (15 questions) on diagnosis/treatment, and Part IV (5 questions) on need of more training in Gerodontology. Their own-perception on self-knowledge and competency was scored on 4 level scale as 3, 2, 1, and 0 for response yes, rather yes, rather no, and no, respectively. Average scores were calculated and presented. Results: The differences of the opinions as per students' perception level were found to be slightly more affirmative in GDC students (1.9 for the 4th year and 2 for the 5th year) than TDC students (1.1 for 5th grade and 1.5 for 6th grade). Both clinical and didactic hours should be increased in curriculum according to the TDC (89%) and GDC (79%) students. Separate gerodontology subject is suggested from TDC (76%) to GDC (81%) students. Conclusion: Average scores about own-perception of knowledge and competency about aging, medicine, and communication skills were almost same in both GDC and TDC students. With early clinical exposure, GDC students appear have better self-perception regarding the different aspects of the geriatric dental care including subject knowledge, communications, diagnosis, and treatment planning than TDC students with late clinical exposure. Cranial defects occur most commonly as a sequelae to trauma, the incidence being as high as 70%. The successful management of a case of trauma in an emergency situation requires quick evacuation of the hematoma, repair of the dura, and the scalp but not necessarily the integrity of the calvarial segment as an immediate measure. So the reconstruction of the calvarial defect in these cases is mostly carried out as a secondary procedure. Various materials are used for reconstruction of cranial defects, polymethyl methacrylate (PMMA) resin being one of them. 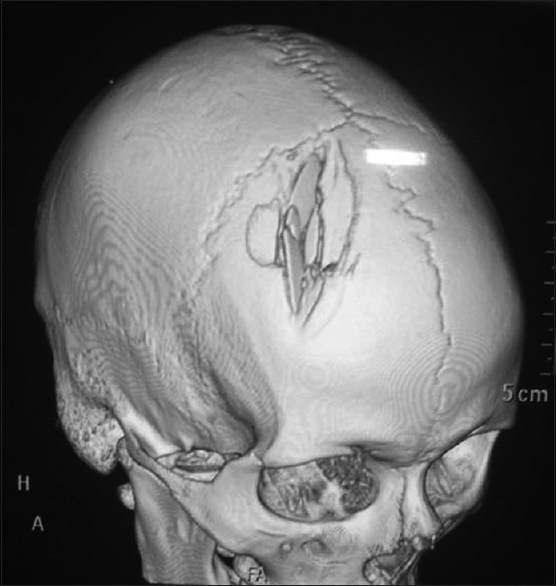 In this article, we report a case which was successfully treated by PMMA resin in combination with a titanium mesh for reconstruction of the cranial defect as a secondary procedure. 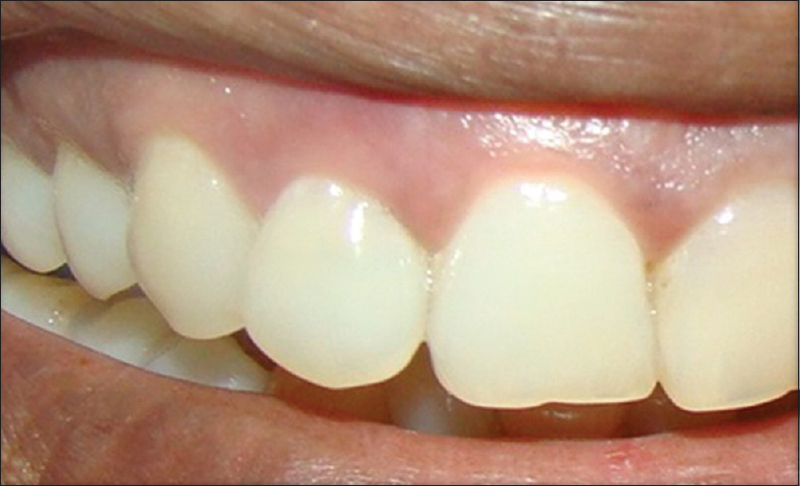 An ideal emergence profile is vital for maintaining gingival health and developing esthetics. The ovate pontic which mimics a natural tooth gives the most appropriate emergence profile. For a successful ovate pontic restoration, an alveolar ridge of sufficient height and width is necessary to enhance the deficient ridge and to achieve an esthetic emergence profile. Interpositional graft was carried out along with ovate pontic to achieve an ideal esthetic restoration. After three months of the postoperative period, there was an increased horizontal dimension in the deficient ridge and an esthetic emergence profile. Interpositional graft technique is a simpler and predictable technique for pontic site development in moderate cases of bucco-lingual ridge deficiency. 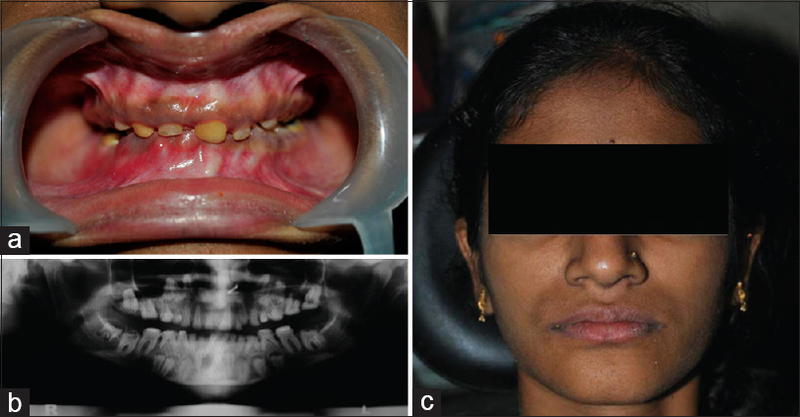 This clinical case report describes the multi-disciplinary approach in the management of an unusual presentation of idiopathic multiple unerupted impacted permanent teeth in a 20-year-old female patient. 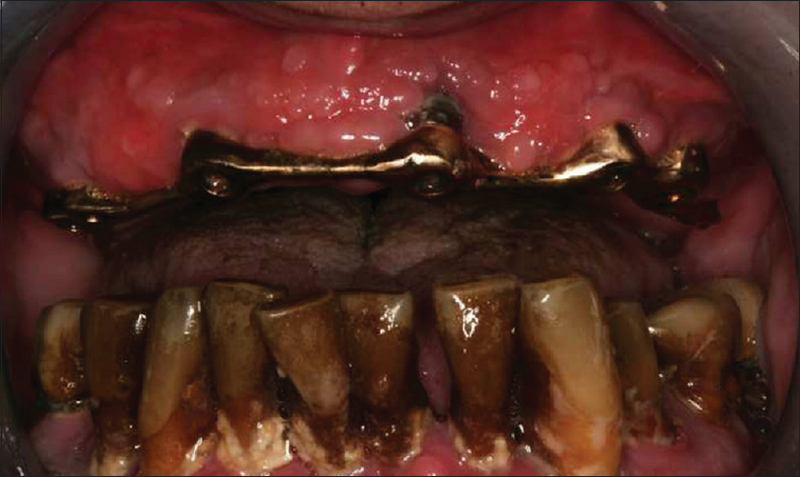 The case was unique in that, not only were there multiple missing permanent teeth, but also over retained deciduous teeth and attrited existing permanent teeth with loss of vertical dimension of occlusion. Since the patient was young, it was decided to retain all the erupted permanent teeth and extract the infected deciduous teeth with the objective of fabricating overlay complete dentures. This is a simple, reversible and an economical treatment modality, which satisfies both the esthetic and functional demands where the extraction of teeth is not generally indicated and, in addition, provides a stable occlusion. Maintenance of adequate and effective oral hygiene is crucial for the long-term success of any dental therapy. 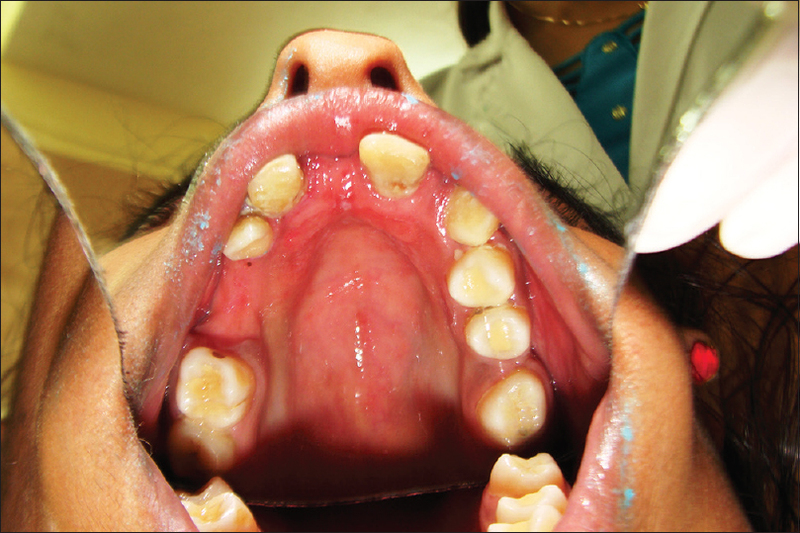 This article discusses a case that failed due to the poor oral hygiene of the patient. Fabrication of uncomplicated restorations, patient education, motivation, maintenance and recall are important factors to be considered when treatment planning patients with poor oral hygiene. Purpose: The purpose of this impression technique is to overcome the problem associated with restricted mouth opening in association with high arched palate by employing pneumatic impression technique using latex balloon. Methods: A stock tray was modified with auto polymerizing acrylic resin. On the modified tray, a latex balloon was attached with aid of cyanoacrylate. The outlet of the balloon was then connected to a clinical sphygmomanometer bulb with the rubber pipe for air passage which would aid in inflating the balloon. The prepared tray assembly was then equipped for recording the impression. An adequate amount of addition polysiloxane impression material, sufficient to cover the entire area of the balloon was loaded onto the tray. The balloon was then inflated with the help of a sphygmomanometer bulb which transferred the air only in one direction. On completion of setting time of the impression material, the air pressure was relieved by deflating of balloon which helped in the easy removal of the impression. The impression was subsequently removed from the oral cavity and disinfected. 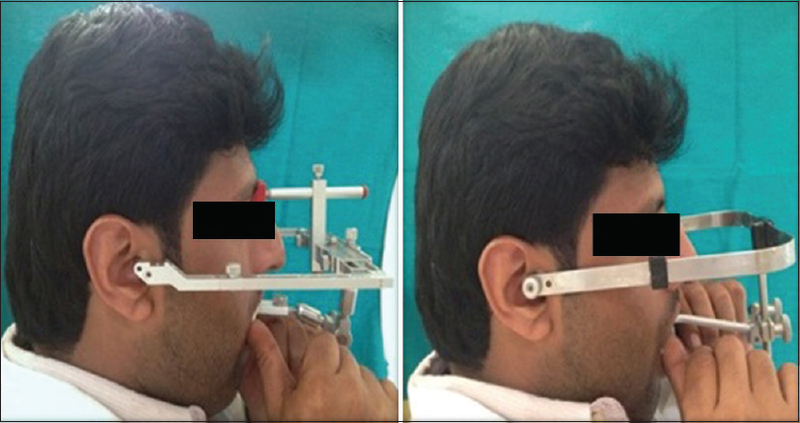 Conclusion: This novel technique was helpful for recording impression in patients presenting with restricted mouth opening and high arched palate.